Washington is known as one of the best small towns in the United States. With rolling hills and a rich community, it is a great place to live and work. Companies and businesses are steadily developing while the community grows. Washington’s showcase is its beautiful fountain in Central Park, which was built in 1939 in honor of the city’s 100 year anniversary. This makes it one of the oldest cities in Iowa! Community activities include farmers markets, art events, car shows, and local concerts. Residential Homes: For custom residential living areas, Greiner Buildings is proud to use post frame construction. This type of building works great for any type of home. It is cost effective, energy efficient, and outstanding in quality. Let Greiner Buildings construct your dream home in Washington, IA. Cold Storage: We build cold storage units for any needs you may have. Customization is our specialty, and we can design and construct a cold storage building for you of any shape or size. Cattle Sheds: As a farmer in Washington, IA, cattle is an important part of your livelihood. Keep them safe and comfortable throughout the year with a custom cattle shed from Greiner Buildings. Horse Barns: Greiner Buildings specializes in building custom horse stalls for your horses, as well as beautiful and spacious stall barns. We can also install haylofts and construct riding arenas. Commercial: For commercial buildings in Washington, IA, Greiner Buildings offers 3D and 2D CAD design as well as various stylish and cost-effective options. Hobby Shop Buildings: Whether you are a carpenter, metalsmith, or artist, Greiner Buildings can build a custom hobby shop to suit your needs. Whatever you can dream up, we can build it. Do what you love and love the building you’re in with Greiner Buildings. Insulated Shops: At Greiner Buildings, we line and insulate our shops to protect you and your equipment from the harsh Iowa winter climate. Machine Sheds: If you are a farmer, it is important to keep your equipment and machinery in a safe place. 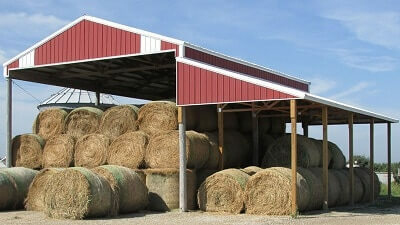 Greiner Buildings can build the perfect machine shed for you. No matter what shape or size you need, we can build it. Mini Storage: Count on Greiner Buildings to construct you a quality mini storage unit that is durable, low maintenance, and that adds curb appeal to your property. Don’t hesitate to call Greiner Buildings for all of your post frame construction needs in Washington, IA. We look forward to working with you!